Last week I was reminiscing about a trip I took last spring to central Nebraska. I know what you’re thinking: Nebraska? I thought the same thing. And even worse, the people trying to get me to go there were luring me with the promise of one of the most spectacular birding exhibitions in the world. I know, I know. I said the same thing. But against my better judgement, I went — and I’m so glad I did. 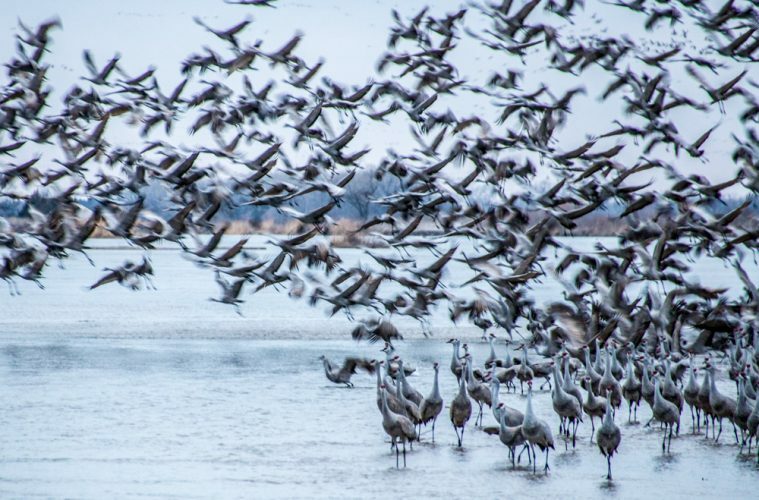 The sandhill crane migration is touted as one of the most extraordinary animal migrations in the world, and in the month of March, roughly 80 percent of the sandhill crane population descends on central Nebraska — blanketing the skies and painting the landscape a bluish-gray hue that will quite literally leave you speechless. So to the entire state of Nebraska, I apologize. And I will certainly be back. Because the spectacle of witnessing thousands and thousands of birds in flight is one that is absolutely worth braving the monotony of I-80 for. For tips on the best places to witness this miracle migration for yourself, check out this piece from our Jan-Feb. issue: elevationoutdoors.com/miracle-migration.